Learn the scale patterns used to play melodies, riffs, and solos on guitar. These patterns include pentatonic and major scale patterns. I cover these patterns and their usage at length in my Fretboard Theory video instruction available on this website. You can view free samples of this instruction by signing up for my emails. 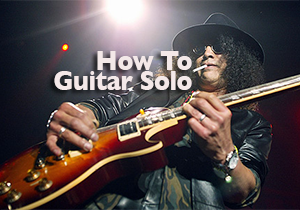 Build your arsenal of lead guitar licks and phrases by learning songs. I reference good songs to learn throughout my instructional courses. Many of these examples I teach for free on my YouTube channel. Specifically, see the pentatonic and major scale playlists. Tabs for these song lessons can be found by following the links in the video descriptions. Other tabs are found on my free guitar tab page. After learning several riffs and solos, learn how to rework their licks and phrases over other music as I demonstrate in the video below. You can follow my examples by playing along with these free guitar backing tracks. In addition to my Fretboard Theory courses teaching you how to play the pentatonic and major scale patterns in which popular riffs and solos are based, you also learn about using arpeggio patterns, modes, harmonic minor scale patterns, and chord tone soloing (a technique in which you target chord tones in your lead lines in order to give your solos more direction and connect them more closely to the music). Fretboard Theory also gets into all the details of building chords, playing chord progressions, and understanding how popular songs are composed. If you would like well-rounded instruction on music that focuses specifically on the guitar fretboard and familiar guitar songs, then Fretboard Theory can teach you how to think and play like a pro easier and faster than you thought possible. To learn more, join the email list by filling in any form on this website or visit the store page. That should do it. Take your time. It’s a slow, gradual process. What amps/effects are you using in the Cocaine solo demo video? Are you using an emulator/playing into a computer? I was going direct into a mixing board using a Line 6 Pod Pro. I believe the patch I used was just overdrive, delay and reverb. I am interested in coming up with some tunes in the e minor pentatonic scale. What chords can I play with this scale? Any popular songs that combine this scale with chords as an illustration? E minor pentatonic can be played over anything that revolves around an E minor chord. Song examples would include “Horse with No Name” by America, “Paranoid” by Black Sabbath and “Running Down a Dream” by Tom Petty. It can also be played over blues based songs that revolve around E major or E7. Examples would be “Purple Haze” by Jimi Hendrix, “Hey Joe” by Jimi Hendrix and “Back in Black” by AC/DC. To learn more about using the pentatonic scale and what goes together with an E minor chord, sign up for a free preview of my guitar theory book and DVD. Is the 33% off summer offer still good? Also, you mention the major and minor pentatonic scales as being by far the most important scales. i have been getting more and more into the Allman Bros, especially the songs written by Dickie Betts. I have read alot about them being highly influenced by the mixolydian scale. Will I find alot of benefit in your course that will apply to their style also. My main interests are Zeppelin, Thin Lizzy, Molly Hatchet, Triumph and Allmans. Hi Desi, are this Video in better (HD) Quality availlable? ore where to buy too learn this nice colle Riffs. A real eye opener for me. I fought the idea of just learning other people’s licks and songs i thought i could just wing it. This might be your first posting in 2018 but anyway although I have only reached chapter 3 ( volume 1) of your excellent Fretboard Theory books I am finding your tutorials very inspirational, in particular your recent “How to Guitar Solo” video that you very kindly posted to me recently. THANK YOU! Keep up the good work. I am at the “I’m sick of scales stage”, but not linking it all together. Hopefully with your guide I can move on. Thanks, Peter. I’m glad the instruction is working for you. Let me know if you need any help. Great video Lots of good information.